Data Centre 'Optimised' service contracts combine traditional maintenance with data centre energy optimisation services to help reduce operational costs. The illustration shows an example of how combined energy and service contract costs compare between a traditional maintenance contract and an optimised service contract model. 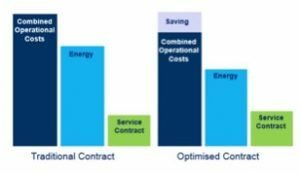 Whilst there is a small increased cost associated with an optimised service contract the overall combined operational costs are reduced due to the impact of ongoing energy savings. The following outlines the key elements of an 'optimised' service plan. Data Centre Audit - During the initial phase a data centre audit will be undertaken in order to identify key areas of improvement within the current arrangements. The data centre audit report will highlight a range of recommendations detailing the predicted impacts they will have on the overall data centre performance. Implement Audit Recommendations - The implementation of the data centre audit recommendations is the first step to making meaningful improvements to the data centre energy performance. Optimisation Services - Data Centre Energy Optimisation services are designed to address data centre imbalances by fine tuning system settings and configuration arrangements with the aim of achieving optimum energy performance. During the initial phase, a data centre audit will be undertaken to identify key areas of improvement within the current arrangements. The data centre audit report will highlight a range of recommendations detailing the predicted impacts they will have on the overall data centre performance. The implementation of the data centre audit recommendations is the first step to making meaningful improvements to the data centre energy performance. Data Centre Energy Optimisation services are designed to address data centre imbalances by fine tuning system settings and configuration arrangements with the aim of achieving optimum energy performance. Ongoing energy improvements achieved by implementing optimisation as part of an overall service contract can range from 5% to 30% depending on the current performance of the data centre with typical average improvements in the region of 15%. Data Centre Energy Optimisation services should be implemented as an integral part of an overall data centre service and support strategy. Optimisation should be undertaken on a regular basis or when major IT load changes occur to ensure that data centre systems are operating at optimum performance levels. Click here to view our Optimised Service Brochure. For more information on our full range of data centre maintenance and support services please contact our sales team on 0121 354 4894 or send us a message.